All 2018 participants, their guest, and firm sponsor are invited to celebrate the completion of the program. 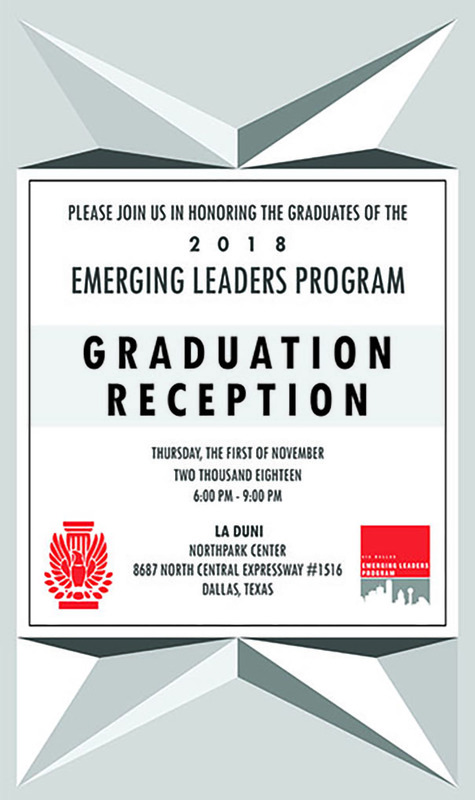 The Emerging Leaders Program identifies, cultivates and mentors young leaders in three areas of leadership: the firm, the profession and our community. Now in its 10th year, the program boasts more than 200 graduates and has received awards from both AIA National and the Texas Society of Architects. The course draws rave reviews through its curriculum that combines class-developed panels, leadership discussions led by Pete DeLisle, PhD, and a class project benefiting the greater community. But don’t take our word for it, click here to hear from graduates of the program.